Let's find cures in 2019! "Until the DAY we find a cure!" Provide “direct” funding for medical research towards a cure of Pediatric Brain Tumors so that one DAY no child need suffer from such a difficult journey. We fund research directly related to a DAY where treatment for childhood brain tumors is less toxic and ultimately curative. 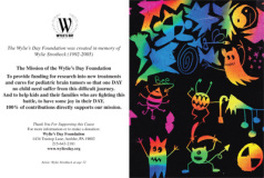 The WDF assists children and their families, who are fighting pediatric brain tumors- to make their DAY a better DAY, by funding beneficial programs and activities.